I ran into this problem a few years back, today re-installed the game fresh, applied 1.05 patch, and loaded it up. The problem still exists. In the two Punic War (264 and 256 BC) scenarios the Roman Consuls are always activated! I've quickly simulated turn after turn, and without fail the Roman Consuls never cease to be active on every turn, regardless of strategic ranking, even when new Consuls are elected. Carthage is working properly, the Greeks are good, and all the other scenarios appear to be fine as well (both Roman and non-Roman factions). But this bug is frustrating, and I'm planning a PBEM of these scenarios, but with this bug that might not be playable. Which is too bad, as these scenarios are great! Anyone else run into this problem? Anyone mind testing this out on their own BOR? My settings have normal activation rules, I've tried searching in the Settings files for a clue as to why this is happening, and in the "General" opt file AlwaysActivable = 0, so that appears to be fine. It's weird cause it appears only these two scenarios are affected, and just the Roman Consuls (the Praetors de-activate as per usual). Which makes me think it's in one of the scenario specific files where this problem lies, or with the models themselves? It can be WAD but I'm not sure. Romans could use night crossing option at start. As it is mountain terrain they won't be defeated easily in Messena. Edit: Ooops may be I understand your question wrong! Baris wrote: It can be WAD but I'm not sure. Romans could use night crossing option at start. As it is mountain terrain they won't be defeated easily in Messena. Haha yep not talking about any political or strategic options, just activation in general. It also appears to be happening to Roman Consuls in Hannibal as well to me. But it's very odd that it is only in certain scenarios. Hmm. I completed the long First Punic War scenario a couple of weeks ago but did not notice this happening. Indeed I clearly recall instances where one or both Roman consuls were not active and this actually cost me dearly in the campaign for Sicily. Random wrote: I completed the long First Punic War scenario a couple of weeks ago but did not notice this happening. Indeed I clearly recall instances where one or both Roman consuls were not active and this actually cost me dearly in the campaign for Sicily. Okay, clearly something on my end then. I had a feeling it was unique to me, otherwise I'm sure it would've been brought up sooner. Thanks! Just one more question.. You were playing with it patched to 1.05, yes? I thought Roman consuls at start always acticated. As Random mentioned it can be related to their strategic rating and can not be active sometimes. Yes. Of course legions of deceased brain cells since may have effected my memory of this but I am pretty certain that on some occasions consuls failed to activate in the long 1st Punic War scenario. Baris wrote: I thought Roman consuls at start always acticated. As Random mentioned it can be related to their strategic rating and can not be active sometimes. On turn 1 if they're always active that's fine, but on literally every subsequent turn they are active as well. Like no matter the month or year, the Consuls are active. Which is big in an Ageod game. Haha I'm sure you remember correctly! Maybe someone will have some clue of what's happening on my end! Playing the same scenario at the moment and I think you are right. My Roman commanders are always active. Seems to be a bug. Canon wrote: I ran into this problem a few years back, today re-installed the game fresh, applied 1.05 patch, and loaded it up. The problem still exists. Yep, I just finished a game of the 1st Punic war today and noticed the same problem. I also tried doing a clean re-install and applying the 1.05 patch; the consul activation remained 100% all the time. Does this means ever consul is throwing his seasick, sacred chickens into the ocean? Quirk wrote: Playing the same scenario at the moment and I think you are right. My Roman commanders are always active. Seems to be a bug. Straight Arrow wrote: Yep, I just finished a game of the 1st Punic war today and noticed the same problem. Thanks guys! It would appear that a bug has indeed crept in with the Consuls. Has anyone noticed it in other scenarios? I may have come across it in the Second Punic War Scenarios on HAN, but will test further to confirm. Are the developers/moderators still active enough with AJE to do something about this you think? I do not possess the HAN add-on, so I cannot comment on this. But in the other scenarios of BOR and PAR I have not encountered this bug. Seems to be a problem exclusively with this scenario. I checked HAN scenario 3 second Punic war 219 and it looks like the bug may be there also. I ran 13 quick turns and no consul failed an activation. It may also effect 3 star leaders because Bagga and Syphas (Mauretania) also seem to be active. I did notice some lower rank leaders failing activations. The Consuls in the Punic War Scenarios are listed as General/Admiral (in BOR, haven't fired up HAN yet, but I'm assuming that could be happening there too). In the other scenarios (Pyrrhus, Samnite Wars etc.) 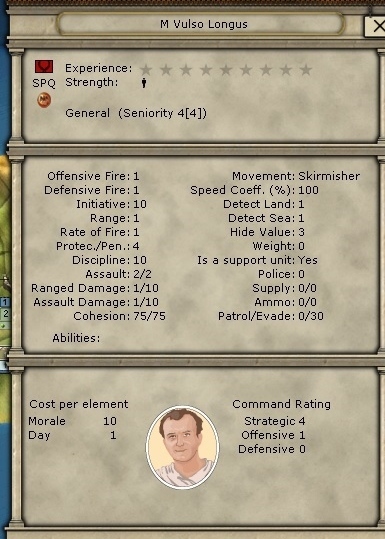 the Consuls are listed as just Generals. Now IIRC admirals in AGEOD games never fail activation, so could the fact that they are tagged as Admirals be causing them never to fail? jack54 wrote: It may also effect 3 star leaders because Bagga and Syphas (Mauretania) also seem to be active. I did notice some lower rank leaders failing activations. This would seem to disprove this, so I'll take a careful look at them and see if this is indeed the case. From the 264 BC Punic War Scenario, Longus did go inactive for me, so I think my theory is on to something. Regulus never failed his activation. When I ran a bunch of turns Bagga did go inactive occasionally. Syphas didn't, however he does have a 5 strategic rating so I think it's safe to assume he is working properly. The good thing is I think this is a pretty easy fix. Looking up the models of the two above generals, you can see that Regulus has an extra line of NavalLeader = 1, whereas Longus does not. I imagine the fix is to remove this line from each Roman Consul. Easy, but tedious. I checked again and Bagga does deactivate.. took some turns with the 4 strategic rating. I deleted the Naval leader line for Paulus and Salinator (HAN 3 scenario) deleted the model cash but so far no difference although it Certainly seems it could be the issue. ... bad news it looks like each game may have all the models yikes! I changed the files in HAN folder then played the game through AJE which seems to have it's own models. Good luck on your end. jack54 wrote: I checked again and Bagga does deactivate.. took some turns with the 4 strategic rating. I did run several tests, inspect the logs and investigate the wiki. The ''always active'' issue is related to consul being Naval leader. I do not see any easy fix for this issue but removing the Naval leader parameters for Consuls. It should solve to some ''landing order'' issue, the consul staying with the fleet while units are landed in hostile region, if i recall correctly. Bohémond wrote: I did run several tests, inspect the logs and investigate the wiki. 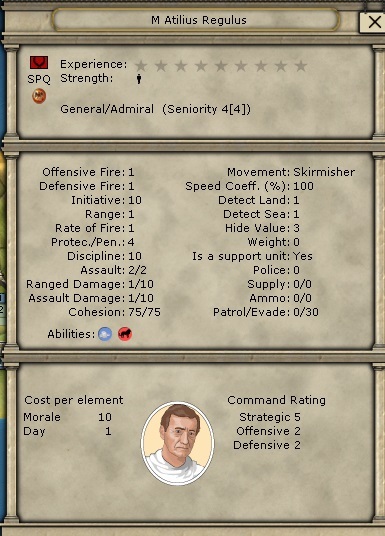 I've gotten spotty results removing the Naval Leader aspect from Consuls. With the two starting Consuls from the 264 BC Punic War, Flaccus ( strategic rating of 3) remained active for his entire term, whereas Caudex (strategic rating of 4) stayed active for one turn, then went inactive for the remainder of his term (6 or 7 turns)... Similar results have occurred on multiple tests. It seems like they get stuck in whatever mode they happened to be in on a specific turn. Something is rotten in the state of AJE... fortunately (or unfortunately) I believe it only affects the Punic War Scenarios (Birth of Rome and Hannibal), but clearly something has gotten screwed up in patch 1.05. The ''always active'' rule for admirals cannot be removed, as far as I know it is harcoded. :*+1 Strategic Rating: A Leader who was active during the previous game turn increases his Strategic Rating by one (1) for purposes of the Activation check. :*Variable: A Leader of a Corps that is located within the Command Radius of its Army HQ has his Strategic Rating modified by the Army Commander’s Strategic Rating. ::Note that a poor Army Commander can actually reduce the Strategic Ratings of his subordinate Corps Commanders. As there is no command chain in AJE, only the +1 modifier will apply for already active leaders. Is this bug confirmed? It sounds like a bad one especially for PBEM play. If it is confirmed then is anything going to be done about it? Or can be done about it if Ageod has fully moved-on from AJE? I'd like an answer to this also. Inspired by Field of Glory 2, I fired up the 1st Punic War Scenario and I'm seeing the same problem with the Roman activations. No responses here for awhile gents... I was hoping it was a quick fix but it doesn't appear to be that way. From Pocus's hints on the main board it would seem that Ageod is 100% focused on their new engine/game, which is understandable considering this game is now approaching it's 6th birthday. I still hold out a sliver of hope that this will be addressed eventually down the line, but who knows when the Devs will have time to take a look at it. Unfortunately, the Punic War scenarios are unplayable until then really, unless a member finds a fix on their own. I had thought to play for pbem the scenario of the second punic war. Do you know if this error is solved and can this scenario be played by pbem?